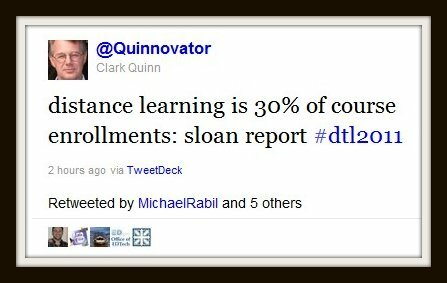 2010 Sloan report: Say What? 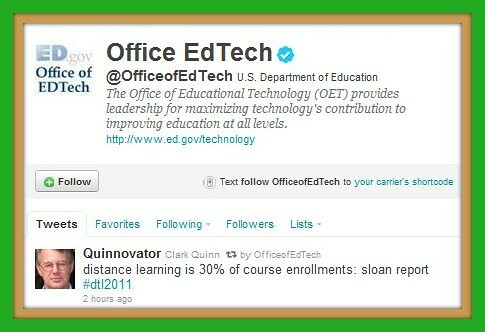 I have no doubt that Clark Quinn heard this directly from the presenter’s mouth in a session at the conference. Everyone else in the room heard it too. Because it was retweeted many times (more times than the 6 shown above), many other people around the Twitterverse saw this stat as well. It was even retweeted by the U.S. Dept. of Ed. Only one problem. It’s not accurate. Don’t blame Clark Quinn for spreading misinformation. Don’t even blame the session presenter, whoever that was. The blame for the misinformation goes directly to the Sloan Consortium, and the way they chose to represent and describe some of the data from their 2010 report – Class Differences: Online Education in the United States. I’m guessing that the conference presenter got his information from page 12 of the report which includes the table shown below (except for the red graphics that I added). This table has VERY misleading captions for the last 2 columns. The column in the middle contains the crucial data for this table. The number of students taking at least one online course. The numbers in the next two columns are based on that center column – a) the growth rate from year-to-year in the number of students taking at least ONE online course, and b) the percentage of enrolled students who are taking at least ONE online course. 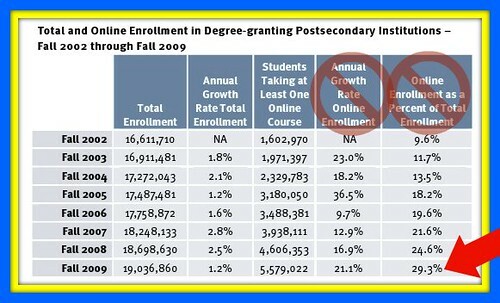 The caption says: “Online Enrollment as a Percent of Total Enrollment” and for Fall 2009 that would be 29.3%. NO!! That is totally wrong. If an educator says that online enrollments make up 30% (or even 29.3%) of the total enrollments, then they DON’T mean that 30% of the enrolled students are taking at least one online course. It doesn’t mean that at all – but now there are hundreds of people out there who think that online learning somehow comprises about 30% of the total course enrollments in the U.S.
Great data table – NOT! !